In excellent working condition, tested, 3" W X 2 1/2" H.
Size 80 x 80 mm (Front). Rear 70 mm. components and parts for over 40 years! (En Español). Full scale value: 50 Ma DC (90 deflection). Has a mirror stripe behind the needle. USED ANYPLACE A VERY SMALL DC CURRENT IS IMPORTANT FOR YOU TO MONITOR. Internal resistance: 1 ohm. Full scale value: 1 Ma DC (90 deflection). Has a mirror stripe behind the needle. USED ANYPLACE A VERY SMALL DC CURRENT IS IMPORTANT FOR YOU TO MONITOR. Internal resistance: 170 ohms. Full scale value: 50 Ma DC (90 deflection). Has a mirror stripe behind the needle. 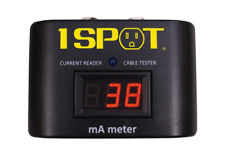 USED ANYPLACE A VERY SMALL DC CURRENT IS IMPORTANT FOR YOU TO MONITOR. Internal resistance.5 ohm. Accuracy: /- 2.5% of full value. 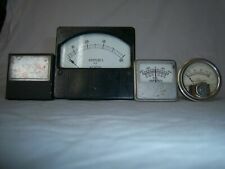 Vintage Western Electric 0-1.5 milliamp Meter TESTED AND WORKING PERFECTLY. The case has a small crack in the Bakelite housing which can be seen in one of the photos above. However it does not effect its performance in any way. I suspect that it was never installed due to the crack/defect in the case. It fits in a 1" hole. It contains all hardware. Scale: 0 to 500 mA. New in working condition. Includes Brass Stud Nuts & Washers. 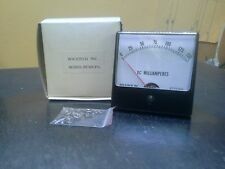 0-200 DC Milliampers. Mounting Depth including Connection Studs 1-13/32". Cool piece, and a great little piece of History! It has no scale and at rest the needle is on the right side. It has no scale, you can write your own. As you increase the current, the needle moves to the left. It's sold as tested against a Fluke 88 (see pic) and is working well.